A coffee cup for photographers and camera freaks. Realistically designed to look like a camera lens to resonate with serious snappers. Two lids so you can inevitably lose one and still have a spare assuming you can find it. 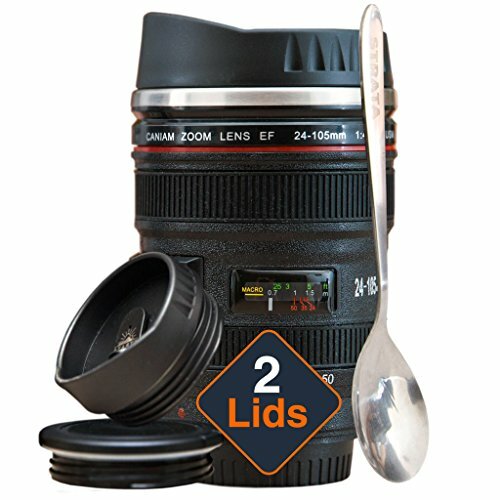 The camera lens cup is thoughtfully provided with screw on lids so they won’t pop off spilling hot coffee into your lap. And there is a spoon thoughtfully provided in case you prefer your sweetened coffee shaken and not stirred. You can, of course, put any liquid into the lens and it will stay cold or hot as the case may be or if you are so inclined you could dehydrate and store your pens and pencils in their instead. Whatever, if you have a friend who is photography mad then this would make a perfect photography themed gift. If they end up trying to fit it to their camera then buy them glasses not a cup next time. Perfect gift for people who love photography. Looks exactly like a camera lens and comes with a spare lid. Has durability and can be packed for travelling. Made with strong stainless steel.